The highly sought after New York based pianist-composer continues his musical journey with Links. This high octane CD brings together three musicians with whom pianist Luis Perdomo has long standing musical relationships. Bassist Dwayne Burno and Luis began playing together, soon after Luis' arrival in New York City by way of Caracas. 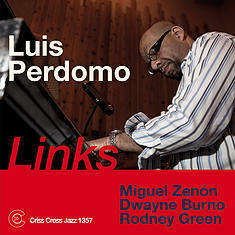 Drummer Rodney Green often pairs up with Luis in a variety of ensembles, most notably on Joe Sanders' Criss Cross release Introducing Joe Sanders (Criss 1344 CD). Last but not least, Perdomo has been an integral part of the groundbreaking quartet led by saxophonist Miguel Zenon for the last 14 years. Together these four masters bring to life a program consisting of music deeply associated with Perdomo's career. Compositions were contributed by each member of the band, combined with pieces penned by artists very dear to him: Maestro Gerry Weil, Luis' first piano teacher from the inception of his life as a pianist, Harold Danko and Sir Roland Hanna, Perdomo´s teachers throughout his pivotal college years, one piece by Luis´ wife, the bassist Mimi Jones also known as Miriam Sullivan, and two compositions by Woody Shaw and Elvin Jones. This CD is a must listen that will leave you wanting to hear more collaborations from this quartet, as well as future projects from this consummate and accomplished pianist, who has become very influential in recent years.